Before I set sails across the Pacific, I thought I’d revisit a car from JCCS. This 2-door, hardtop Celica GT coupe stole the show for me at JCCS. 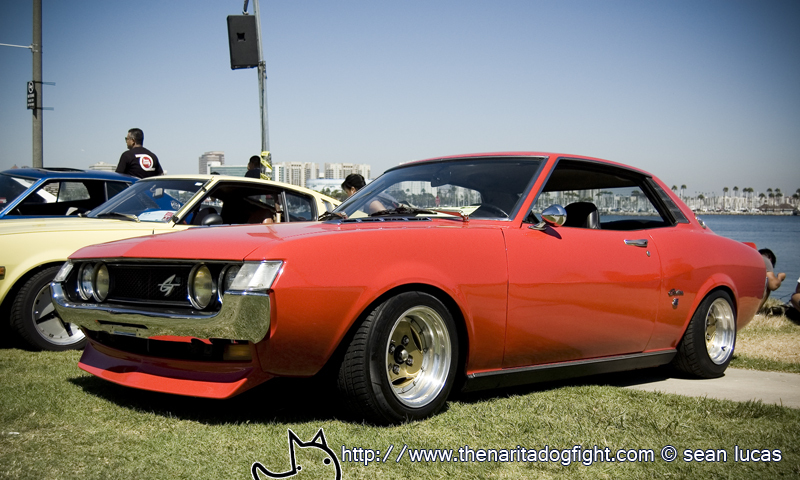 This model of Celica was first made in the 1970’s and heavily influenced by the late 60’s, early 70’s Ford Mustang. A cheaper alternative to Toyota’s sports car, the 2000GT, the Celica became massively popular. This particular one was in great condition. Although the car was sitting on an uneven surface, the stance was still almost perfect. It was drawing quite the crowd. The duckbill trunk wing is the perfect compliment to the old school lines. The gold Advan A3A’s match the red body perfectly. I didn’t get a chance to talk to the owner to find out what was under the hood, but I’m sure that whatever is in there is just as clean as the exterior.